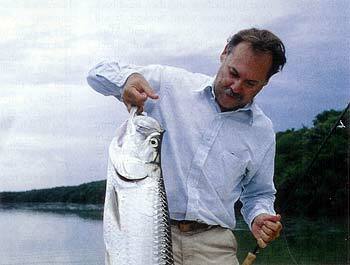 SEVERAL YEARS AGO, I hosted a group of eager fly fishers for a week of bonefish and permit angling in northern Belize. Upon touchdown at the little airstrip, however, I quicky realized that every palm tree in the area was bowing deeply to each passing gust, and as I stepped off the small airplane my mind raced with backup plans for any type of fly fishing besides sight casting to shallow-water bones. With wind speeds approaching 30 miles per hour, our prospects for a successful trip looked bleak. Nonetheless, by the next morning, every guide and angler at camp had a plan: find a lee, walk the beach with the wind at the caster’s back, look for mudding bones in at least two feet of water, and more. I decided to have our guide run my angling partner and me to the mainland, which would leave us mostly on the lee side of a north wind. I knew that those flats often held snook and baby tarpon in just inches of water, and after pounding for an hour in a flat-bottomed panga we arrived at the flat. As predicted, we were protected from the north wind, but a high incoming tide and the surrounding gusts had made the water too murky to sight cast. Not wanting to give up, our guide motored up a small river that twisted into the jungle. After a half-hour ride, he stopped. We had a bit to eat and then started to drift downstream. The tall mangrove trees offered good shelter, and the water was fairly clear. I could see an occasional tarpon rolling as schools of baitfish sprayed the shorelines. My friend offered me the first cast in order “to see how it was done,” so I took out a 275-grain sinking line on an 8-weight rod and attached a bright yellow Crystal Shrimp, a productive color for these tannin-stained waters. I cast just ahead and to the side of the drifting skiff, only a couple of feet from the shoreline mangroves, and then let the fly sink for a few seconds before starting a slow retrieve. On the second cast, I hooked a snook, and a few casts later I had another. I turned to my friend and tried to hand him my rod, but he preferred to use his floating line and a heavily weighted Clouser. I tried to explain that the floating line and strong current were not going to let any fly sink very far, no matter how much weight it had. After a half hour of no takes, he had changed flies a dozen times. But the problem was simply that his fly could not get down far enough. Nothing had seen his offering. As soon as he agreed to take my rod, however, he hooked a fish. And then another. And another. While he caught fish, I shot photos and ate another sandwich and drank soda. Later that afternoon, on the way back to the camp and still under strong winds, I had the guide stake our boat at the edge of a bonefish flat within an easy cast of a channel. Here, in about eight feet of water and using the same sinking line, we caught yellowtail snapper, mutton snapper, jacks, and a small bonefish. After word of our success got around camp that evening, I was rigging every spare sinking fly line I had and every sinker that the camp could find. The next day, every angler had a fish story to tell, and although it blew hard most of the week — perfect conditions for disappointment — on the plane ride back the talk was about sinking fly lines and our next adventure. Today, I never go on a fly-fishing trip without bringing several sinking lines. They can save your week when the weather is poor and extend your opportunities when skies are fair. You can buy fly lines that easily sink to 10 or 20 feet, and some of the fastest-sinking lines will get down 60 feet or more. There’s no doubt that most anglers should start with a floating line. But after you’ve learned to cast a moderate distance, say 60 feet, and after you have taken a few fish, you’ll want to scratch beneath the surface. Of course, choosing a sinking fly line can be overwhelming. Look at a few catalogs and you’ll find scores of options: partial-sinking lines, full-sinking lines, some rated by the “weight” of the rod, others classified by the grain weight of the line, and still others defined by the actual sink rate of the line (e.g. three inches per second). There are good reasons for most of the lines offered, but a first-time buyer is wise to simplify the issue. On most trips, in addition to my floaters, I bring two densities of sinking fly line. First, I always pack a clear, neutral-density line for slow sinkng down to about five feet. Second, I bring a fast-sinkng line for getting down as much as 20 feet. That’s all I typically need. Depending on what type of angling you have in mind, consider making one of these types your first sinking line. The neutral-density, clear lines do not have air bubbles in the coating mix to keep them afloat, nor do they incorporate any kind of heavy element, such as tungsten, to make them sink fast. So, being just a bit heavier than water, they sink slowly. Because these lines are clear like your leader, they are deadly in many situations. I fish them in basins over sea grasses in three to six feet of water for trout, flounder, jacks, snapper, and more. If you like to chum over reefs for snapper, jacks, and mackerel, or in blue water for bonito, albacore, kingfish, dolphin, and others, this line will get your fly down a bit and is very inconspicuous to the fish. If you like blind casting the beaches, whether it is Nantucket for stripers or mid-Florida for snook, the low visibility will enhance your number of strikes. Unless the beach is very shallow or unless I am using a popper, I fish the shore with a clear, slow-sink line. 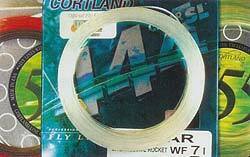 You’ll find this type of fly line sold by the rod weight and in the weight-forward design, the same as for floating fly lines. However, I prefer to buy them one size heavier than my fly rod calls for. The extra mass loads the rod better during your false casts, and unless you have a very slow or soft rod, I’d go that route. My fast sinkers are integrated fly lines in which the head of the line sinks and the running line floats. The first 30 feet or so is dark gray and the rest is a bright color. Just false-cast until the gray part of the fly line is mostly or entirely out of the tip of the rod, and then shoot some of the running line. With practice you can achieve great distances, even in a strong wind. I use these fast-sinkng lines to get the fly close to the bottom while fishing creeks and small rivers, or when fishing the many channels between flats in the backcountry for snook, baby tarpon, redfish, sea trout, tripletail, and jacks. Or I fish them in the channels around bonefish flats for big jacks, a variety of snapper, a few grouper species, and quite often bonefish, too. Drifting and blind casting a fast sinker in shallow reef areas, say between 15 and 50 feet of water, can produce a large variety of species. Your fly does not need to get to the bottom to bring results. Often, a snapper, grouper, or other bottom fish will meet you halfway and then head back for the bottom when hooked. It will be up to you to stop them! Many midwater species, such as mackerel, jacks, yellowtail snapper, and others, will follow the fly and often take right by the boat, which is very exciting. As a rule of thumb, rig your sinking lines with a leader about the length of your fly rod — or nine feet. Resist the temptation to use a very short leader, as some anglers recommend. In fairly clear water, or in the often gin-clear water of a reef or offshore, a short leader with the dark sinking lines will get very few strikes from big fish. Most of your hits will come from half-pound jacks or small snappers. Large fish will often follow the fly for a while, even all the way to the boat, but then turn away. Plus, a very short leader, say less than four feet, will cast poorly because it does not help cushion the cast at the end of your forward and back strokes. The little “bump” at the end of every false cast will drive you crazy. Stick to a nine-foot or longer leader on flat, calm days in clear water. Some of the best anglers I have ever fished with in deep water use mid-length to long leaders with their sinking lines. You can carry your extra line in the spool it came in, already rigged. But that method takes too long to swap with the floating fly line. It’s better to carry the sinker on a spare reel or a spare reel spool. When the need arises to get the fly down, quickly cut the fly off, wind in the floating line, swap reels and string up the sinking line. Better yet, if you know you may have a chance to use a sinking line during the course of the day, carry a spare rod with a sinker already rigged and ready with sharpened fly. I often fish with my son, Stephen, in the Everglades flats for redfish. I’ll pole him in the shallow water while he casts a floating-line outfit. As we approach the end of a flat, maybe 30 feet away, he will put down the floater and pick up a sinking-line rig. When we are within 20 feet from the end of the flat, he will cast past the drop-off and into the deep channel. Stephen lets the fly sink and works it back up to the edge of the flat, which is a great area to fish. Then I pole the 5- to 10-foot-deep channel across to the next flat while he fishes the sinking rig deep or close to the bottom. (We’ve taken big snook, reds, sea trout, large jacks, pompano, and even hooked an occasional 100-pIus-pound tarpon doing this.) As we approach the next flat, he will wind in the sinking line and take up the floater in preparation for the shallow water. And at this point, if he is being a good son, he will offer to pick up the pushpole and let Dad take the fly rod — something he often does these days. Think a little deeper, and you’ll find life is just as good for you.